After going through much of the offseason unsigned, the Yankees swooped in and signed versatile infielder Neil Walker to a one-year deal worth $4-million. 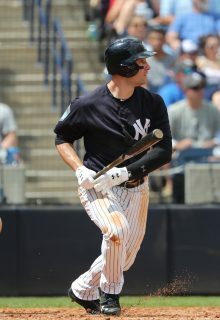 Despite signing the 32-year-old veteran to a big league deal, Walker is expected to begin the season coming off the bench, and he should see time at second, third, and first base with the Bronx Bombers. Now with his fourth big league club, Walker will make to look an impact on an otherwise youthful Yankee team. Walker opened up the 2017 season as a member of the New York Mets, before a midseason trade sent him to the contending Milwaukee Brewers. With the Mets, he slashed .264/.339/.442 with 10 dingers and 49 RBIs, and 14 doubles in 73 games, and with the Brewers, he slashed .267/.409/.344 with four homers, 13 RBIs, and eight doubles in 38 games. Cumulatively, Walker played 111 games last season to combine for a .265/.362/.439 slash line with 14 home runs, 49 RBIs, and 21 doubles. Though his power was slightly down, those numbers should increase in a hitter friendly Yankee Stadium. Walker also hit a career high in walks with 55, and that accounted for his .362 on-base percentage, which also marked a career high. It is worth noting that as a switch hitter, Walker hit much better as a lefty than he did as a righty, with a .277/.372/.470 slash line from the left side, as opposed to a .214/.313/.298 line from the right-hand side. He also did not hit any home runs as a righty in 2017 in 97 plate appearances, with all of them coming from the left-hand side. The Yankees have run into issues with switch-hitters performing at much higher rates from one side than the other, but with short porch in right field, the Yankees will have no problem sitting Walker out against left-handed pitchers. As previously mentioned, Walker is expected to play first, second, and third base as a member of the Yankees. Before 2017, Walker had never made an appearance at first base, but that versatility should allow the Yankees to carry a three-man bench through most of April, given the news that Jacoby Ellsbury is expected to start the season on the DL. With only three off days in April, the Yankees will need an abundance of pitching, and for that reason, it might be wise to carry 13 arms on the staff. With the signing of Walker, this leaves Ronald Torreyes and Tyler Wade in a battle to make the big league roster. Both are displaying their skills and enjoying very solid spring trainings, so it will be interesting to see which one of the two makes the roster. Whichever player makes the roster will likely see many starts at second base, but will be often moving around, similar to Walker. The Yankees really enjoyed the fact that Walker fell into their lap a few weeks ago, and he will be utilized heavily this season. He may not have an “everyday” position, but Walker will likely start four or five games a week, and he should provide a solid presence at the back-end of the order.